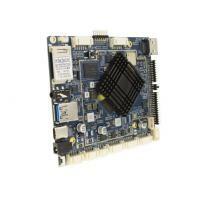 RK3188 Android all in one board, using Rockchip RK3188 quad-core chip program, support Google Android4.4 system. Support the mainstream audio and video formats and picture decoding. Dual 8-bit LVDS interface 1920 * 1080, can drive 7 "to 82" display. Exclusive support for 3G module Internet access, rich interface, so that products become more common, widely used in advertising machines, one machine, security, industrial control, and so on intelligent control. Because of its hardware platform, Android intelligent features, in the need for human-computer interaction, network equipment, interactive, intelligent terminal platform can be used. High performance. RK3188 chip using quad-core A9 program, it’s currently on the market one of the most powerful quad-core chip. Using the chip RK3188 motherboard program, compared to the common market of single-core, dual-core, quad-core program, a qualitative leap in performance, to play a variety of formats HD video, can handle complex interactive operation. High stability. RK3188 Andrews board, in the hardware, software, to increase their own unique technology to ensure product stability, can make the final product to 7 * 24 hours unattended. Highly integrated. RK3188 Andrews integrated board integrated Ethernet, wifi, Bluetooth, amplifier, SD card, 3G data interface, backlight power supply and so on, greatly simplifying the machine design. Ultra-thin motherboard design, make the machine design more beautiful. High scalability. Four USB ports, three serial ports, can expand more peripherals. DIF LVDS interface(Single, 6-way, 8-way dual).Support maximum resolution 1920x1080, support 7 "-82" display. Touch screen Provide I2C interface (can support multi-point resistance touch, multi-point capacitive touch).Support USB multi-point infrared touch, multi-point sound saw touch, multi-point optical touch. Network Have RJ45 interface,support Ethernet. Image rotation Support 0 degree,90 degree,180 degree,270 degrees manual / automatic rotation, support gravity sensing function. The original eco-Android system, open root privileges, can be customized product development.